So, I hollered and bitched and yelled and kvetched and and threatened and pouted and stamped my feet until my ISP fixed my connection, then I went off and did everything but use it. Hey, I was busy - somehow all kinds of crap piled up when I wasn't looking. However, yesterday I did manage to finish a number of bowls. All three of these are spoken for, sorry, but I will have a couple more done this week that will be available. Description: Green turned Alaskan birch heartwood. Hollowform design. There is some slight sculpting which emphasizes the grain pattern along one side. Finished in Danish and Walnut oils. Full image gallery for this piece is here. Description: Alaskan birch heartwood. This piece was taken from a tree damaged in the Miller's Reach/Big Lake fire. The tree itself survived the fire and the wood grew around the fire damage. Ten years later much of the tree had died, and when I harvested it the wood had begun to spalt. This piece dried slowly over a period of several months, until it became hard enough to turn. Slight sculpting to emphasize the heartwood grain lines. Finished in Tung oil. Description: Spalted Alaskan birch. 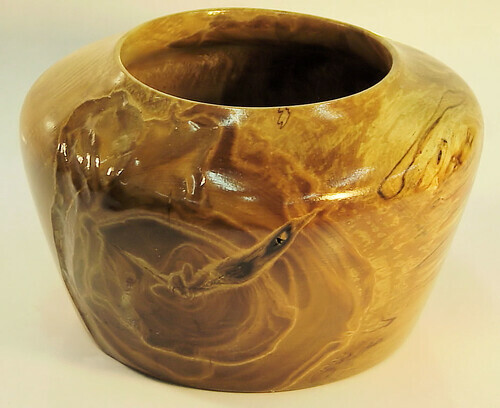 The wood for this piece came from a fallen Alaskan birch tree. The tree had been dead for at least several years and was heavily spalted (molded along the grain lines). The wood was very soft and had to dry for nearly a year before it was hard enough to turn. Finished in Tung oil and acrylic. Whats this? No alien scribe? Perhaps they have left your dreams in peace. The secret to anti-gravity will not be freely given! The recipe to Hive Mother Zrrt'pypqur's home-made brownies though...that's another story. Well, Howie, I guess my implant is on the fritz. Or perhaps the Zeta Reticula Internet link was down when I was making these. Is that second one Shawn's? Shawn's is more complex and is in progress. I should have it done later this week. The wood I'm making his from was extremely wet and had to dry after turning for several weeks. #52 was purchased by a husband and wife from Big Lake, who lost their home in the fire. The wood for this piece was harvested from a tree not far from where they lived. They also commissioned a second, larger piece, which is also in progress and should be done later this week. Those are gorgeous! 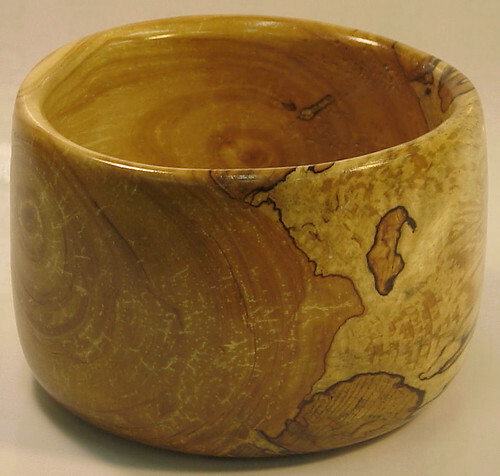 The spalted birch (I learned something today!) has a beautiful grain. The secret recipe to the hive mother's brownies? Hallucinogens. I don't need a message encoded in a bowl to tell me that, I had one when I was in college. Actually, spalting is a type of black mold, the same spore that causes leaf mold on the forest floor. When wood begins to spalt, the mold leaves dark black lines in the wood, usually between the sap wood and heartwood. There's a fine balance between when spalting colors the grain, and when it destroys the wood and it truly begins to rot. Turning spalted wood can be extremely dangerous. First because spalting weakens the wood and it may fly apart on the lathe, but more because the mold is poisonous. Fine spalt dust when breathed in can make you extremely sick (how do I know this? Well...). To turn spalted wood you need either an extremely good dust collection system and/or a good dust mask and filter (NOT one of those cheap 'dust filters' they sell at Wal-mart, but a fitted gas mask or sealed turning face shield with a filtered air supply). I use a high volume dust intake mounted below and behind the lathe coupled to a 1200cfm cyclone collector, which exhausts through a stack of 1 micron cylinder filters. Once turned, the spalted wood must be thoroughly dried and treated with some form of preservative (in my case I use natural oils and a water based acrylic) to seal the wood and kill the mold. Otherwise the bowl will rot away. Once sealed the wood is safe and will last forever. 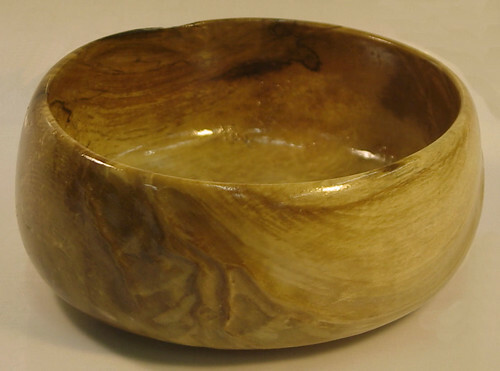 Spalted woods are highly prized by turners for their unique appearance. 51 is absolutely gorgeous! I am wondering if you could make one of those for me down the road when things quiet down for you? Becca, I'd be happy to make you one. Also, I have nearly completed a jewelry box similar to the one you asked about. It's drying in the shop now. It's gorgeous piece, a squat tear drop with a Celtic love knot finale. I'll be doing the sculpting on it this afternoon, then the finish work tomorrow. It should be done at the end of this week. I'll send you an email, along with pictures in the next couple of days to see if it meets your requirements. Yes I would love to see the jewelry box since I am half Irish/half Greek. Give me a good price and you have a deal! Between you and Shawn, you are gonna break me, ya know! I likes me the spalted wood. Anyway I can get me one of those, or is the wood all gone? Ah, excellent. I hope you enjoy them. What a roller coaster! Before I read the comments, I ran around the house showing off the bowl. Then I saw it wasn't, and I was bummed. Then I read ours is more complex, and I was giddy again!! !